You might be asking yourself, what’s up with the name of this blog? It’s a phrase the cable guy delivered after climbing up the telephone pole to determine why my television was losing channels. You’ve got squirrels in the doohickey, he said. It occurred to me, after gnawing on this phrase for a good long while with my mental teeth, we all have moments when we behave as though we have Squirrels in the Doohickey. We start believing all our squirrelly thoughts. We do squirrelly things, like rearrange the kitchen cabinets when we visit. I wouldn’t be surprised if SITD appears in the Manual of Anxiety Disorders, right next to Bats in the Belfry. And let’s not forget the outer squirrels: the appliance that turns itself off, the first date that sends you running, the hurricane that hurls a roller coaster into the ocean. If those things can’t be blamed on Mercury being in retrograde, or getting up on the wrong side of the bed, or global warming, then surely, surely they’re a case of Squirrels in the Doohickey. The antidote to all this squirreliness, I believe, is to find the humor in the situation, then use mindfulness to regain our balance. So I decided to write about this phenomenon from my wry perspective, adding a twist of Zen. Because we’re all alike in some way, we all come from the same spark; and though we’ve split off and spun out and grown taller and wider and older and wiser, we all have squirrelly moments that hijack us from the Golden State of Being. Here they are, then: my wry observations and run-on sentences about the nutty stuff we do, say and think when confronted with the stuff that drives us nutty. If you were hoping to find a blog about tree-climbing rodents in an object whose name nobody can remember, sorry; you’ve come to the wrong place. But you’re more than welcome to stay. Diane Holcomb is a freelance writer and literary junkie who writes book reviews for various publications, including the New Consciousness Review. Her theme of characters escaping reality can be seen in her award-winning short fiction, When the Knock Comes. She is currently revising her first novel for the zillionth time. Hi Diane – I am the tap dancing twitterer! Like your blog! Very interesting! Thanks Arlene. I checked our your site and will definitely revisit it. I could use a brush-up on my grammar! We humans always insist on finding explanations for everything, even when we have no idea what we’re talking about. I think, in most cases, squirrels in the doohickey is probably the best we can do. 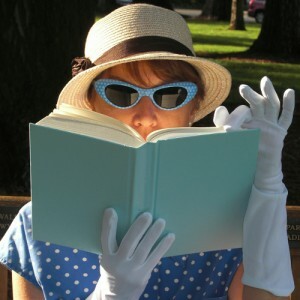 Diane, I love the quirkiness of your blog, starting with its name. Your voice skips lightly, elegantly and amusingly like a… well… squirrel! Interesting analogy! I love it. Thanks! Loved the post about the librarians! God, I’d LOVE to work in the library, yet I’ve seen them burning rubber out of the parking lot while I’m still unlocking my car! Very strange… Funny blog! Maybe all that quiet gets to them. Your blog is fabulous! so real and relatable. Thank you I just started reading your posts and get insight and a kick out of each one. Been sharing some posts on my friends Twitter paper, She has a very large following. I’m @LovinShmay on Twitter…hope to see you there. Hey, thanks! I appreciate the feedback. Insight with a kick. I like that! I’ll look for you on Twitter. Kudos and grins and feels for Squirrels in the Doohickey. 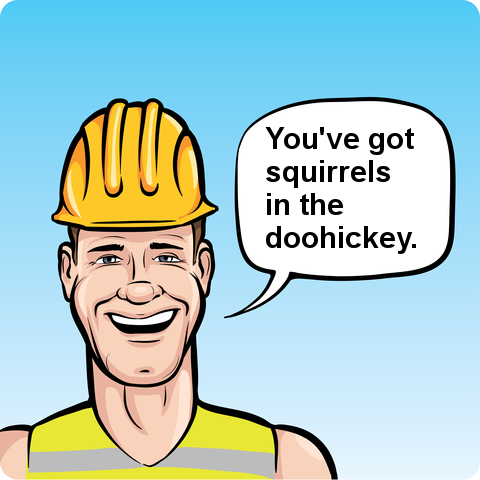 Tempted to use the sudden burst of inspiration to rename my always-feels-under-construction place Six Squirrels in Search of a Doohickey, but that would just be wrong, wouldn’t it? It would certainly be intriguing! Thanks for stopping by. I just found your blog as part of the October Platform Challenge. LOVE LOVE LOVE the name! Even though we don’t have cable currently, I’m guessing we still have our own little clan of Squirrels in the Doohickey-we are plagued by intermittent static on our landline, struggle repeatedly with lapses in our internet connections, spooked by our spooky black cat duo who just “paws”and stare into nothingness, or so it would seem, from time to time, especially when I find myself home alone on a dark, windy night! And, last but not least, I find my sweet little flock of hens spontaneously squawking to beat the band in the middle of a quiet afternoon and when I go to investigate, all are closed beak-they just look at me like I’m the strange one…simply EGG-straordinary!So, from one caretaker of squirrels in the doohickey to another, greetings! Hope you enjoy! Keep on keepin’ on, Diane! Love your post! Chickens as a role-model for good health. Maybe folks will stop eating them! Hi, I have strolled around here before, waiting for your 2016 oncore. I carried some biscuits and a cup of tea. When I came back to visit thee. But I put them back in the tin. I’m glad to have stayed a while. At my blog, it’s not a book. When editing pulls me yonder. Hide from life or have a spat. I’m sure you’ll have a super time. I’ll even make a cup of tea. Put the tea kettle on, I’m a’comin over! Thank you for the delightful poem, and for leaving your crumbs, which are far more than crumbs, my writer-friend. You made my day! I thought of you and your great blog when I came up with a nomination list for a little blog award I really think you deserve! http://caledonacres.ca/liebster-award/ Thank you for your posts! Thanks Laura! I’m honored to be nominated along with other talented bloggers. You made my day! Bun’s guest post brought me here – that, and the name of your blog! Curiosity got to me. Perhaps I have cat genes from a past life. Anyway, my cat curiosity and like for things funny and quirky have decided that I should hang around, so you’ll be seeing more of me. Yippee! I’ll meander over to your blog, too. Thanks for visiting. And commenting! Feel free to subscribe. Always happy to have another quirky guest join the party. Thanks Joey, for the comment, and for the visit! See you again, I hope. Well howdy, stranger! So glad to hear from you. Come on by anytime. Heck, spread the word! Diane – saw one of your clever remarks on Bun’s site & had to click over to your blog – so glad I did! Ah, thanks, Daal. And welcome to Squirrels in the Doohickey! Hope to see you ’round the blog. Thanks! Hope you stick around! I love this: your site, your content, and your perspective. Glad I stumbled across it. 🙂 Good luck on the novel! Hey Gritty Mommma, I’m glad you stumbled! Thanks for the good luck wishes. I can use ’em!